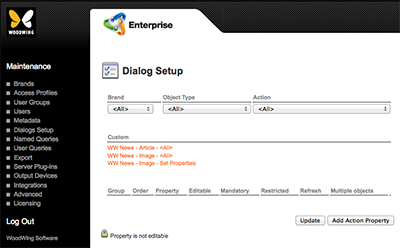 The dialog boxes in Content Station with which files are saved to Enterprise or in which file properties are changed contain a default set of metadata properties. Note: The action named 'Preview' and the actions that contain the word 'Query' are used for adding properties to areas other than dialog boxes. For the purpose of this article they can be ignored. Multiple Objects. 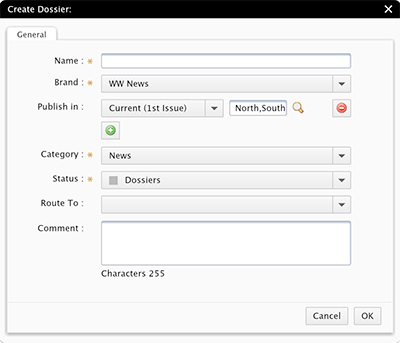 (Since Enterprise 9.2.0. Only when 'Send To' or 'Set Properties' has been selected from the Action list) Select if the property should be available when a Content Station user wants to change the properties for multiple objects or files. Note: Review the settings that are shown for that action, since they may hold additional information.